Male Occurs throughout mainland UK including the Isles of Wight, Man, Anglesey and Scilly, records are more scattered in the north and west; in the west country and Wales many records are coastal. Western Scottish records are coastal including the Western Isles north to Lewis, in the east coastal to inverness although there a few inland records from Moray and Perthshire (NBN). In southeast England a common and usually abundant species of open, including agricultural, land with a general preference for dry situations e.g. on light sandy or chalky soils. Abundant throught the Watford area in a wide range og habitats eg they occur in Whippendell wood where, during May and June, they are common under logs and debris. They will turn up in pitfall traps in parkland, wasteland and gardens, in such situations the adults spend the day among leaf litter around trees and shrubs or in soil crevices. 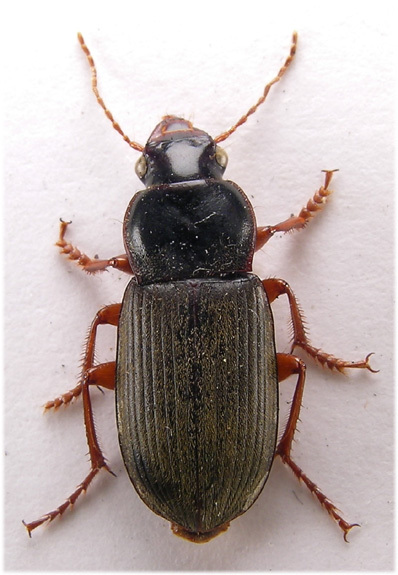 Hinton includes the species in his monograph of beetles associated with stored products from their habit of feeding on strawberries, in the past they have been seroius pests of strawberries, raspberries and young plants and seeds in forest-tree nurseries. 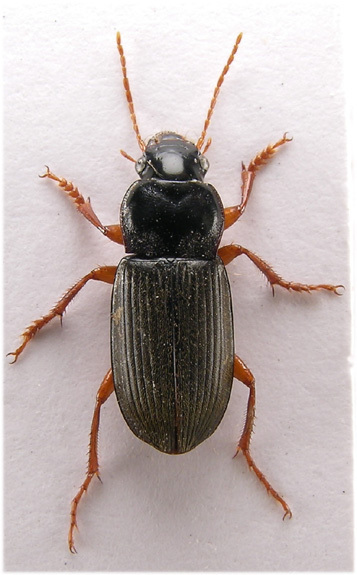 They are also carniverous and have been observed preying on larvae and adults of Sitona species (Hinton, 1945). 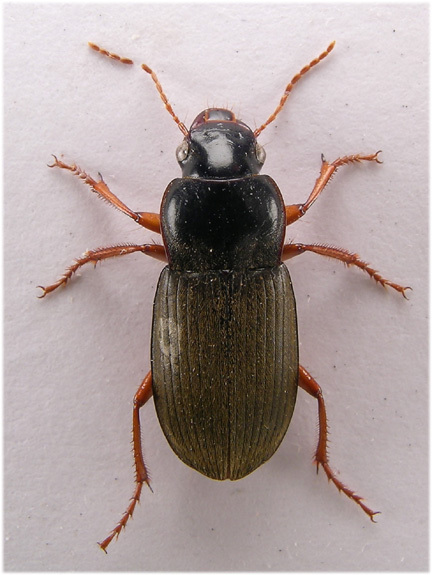 Adults are active nocturnally and perhaps the best way to observe them is by torchlight on parkland pathways; in this situation other, similar sized, carabids eg Pterostichus madidus or Nebria brevicollis are also abundant but the elongate form and densely pubescent elytra of rufipes soon become obvious. We have observed rufipes feeding on the remains of crushed carabids (etc) in this situation on many occasions. Along the bank of the river Colne in Radlett road where the footpath is remote from the main road, rufipes gather, often in the company of other carabids, on warm evenings under the sodium lights among huge populations of ants and aphids (2005-8). Locally the adults become active in late May or early June, they soon become abundant and remain so into September or October although numbers may fall during hot weather in August due to a diapause. The species is fully winged and although we have not recorded them in flight we have on many occasions atrracted them to MV light on vertical or horizontal sheets. They breed in summer and autumn (Luff). 11-16mm. Body entirely black but for obscure macula between eyes (not always present) and sides of pronotum narrowly red. Appendages reddish-brown. Head shiny and smooth or obscurely and finely wrinkled. But for a transverse clypeal suture, which varies greatly in development between specimens, without furrows. Eyes convex and prominent, beside each s single setiferous puncture. Mandibles stout and strongly curved before sharp tips. Antennae proportionally short, finely and densely pubescent from third segment. Pronotum strongly bordered laterally, finely so along base, sides evenly curved then sinuate before acute hind angles. Surface shiny, a little less so than head, rugose and finely pubescent along base and (narrowly) lateral margins. Scutellum glabrous and shiny. Elytra with nine well impressed striae, interstices weakly convex, finely and densely punctate and pubescent. With a series of larger punctures between the eighth and ninth striae, many of these are fused with the eighth stria. Strongly bordered from scutellum to sutural angle, strongly sinuate subapically and rounded at apex. All tibiae with a short long apical spur inside, on the hind tibiae this is as long as, or very nearly so, the first tarsal segment. Protibiae strongly notched inside before apex. Tarsi finely pubescent above. Male pro and mesotarsal segments one to four dilated.